Megahertz to supply BT TVOB with hybrid fibre and satellite UHD truck. 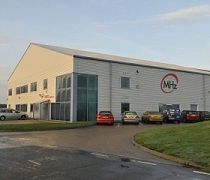 Ely, UK, August 2016: Megahertz has announced that it is to deliver a new hybrid fibre and satellite UHD links truck to BT TVOB, the outside broadcast arm of BT Media and Broadcast. The new truck - known as TES52 - will be showcased on the BT Media and Broadcast stand in the outside broadcast space at IBC in Amsterdam. It is the first truck in the UK with the ability to transmit HD and UHD/4K via fibre and satellite simultaneously. Prior to IBC, TES52 will cover the first Premiership match of the 2016/17 season, supporting customers by providing 14 HD outbound visions (as 1080i and 1080p) simultaneously. Later on this year, it will be deployed in UHD/4K mode providing up to three UHD visions on fibre and one on satellite. The truck will be in constant use until it appears at IBC.